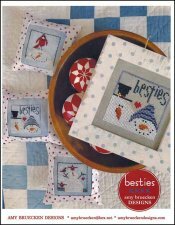 Besties [E6726] - $10.00 : Yarn Tree, Your wholesale source for cross stitch supplies. Cross stitch pattern Amy Bruecken Designs. There is no better "Besties" than snow besties! As the delicate snowflakes begin to fall from the winter sky, a red cardinal and snowman have become best friends. That smile on his face says it all. The second design features best friends for life, Mr. & Mrs. Snowman. A small red heart is stitched between them. The third design features a snowman with his three new friends! One cardinal stands on top of his head, while another cardinal stands on one arm & one on the ledge beside him. He sure loves having his new friends around! A friend is a gift whose worth cannot be measured. Stitch counts for each of the designs is 40 x 38.